Thank you to all the awesome peeps who have signed up for the So Cal Round Up, a Family Style BBQ and trail run at Corral Canyon on April 20th - sign ups are now closed! The plan is to start one group on Sidewinder, the other group on Gunslinger through Bronco Peak. After Sidewinder group finishes they will jump on Gunslinger/Bronco peak, while the other group jumps on Sidewinder. That way the groups should be spaced out enough so there is no congestion on the trails. Minimum Requirements: Tow point front and rear, and your own strap. It is strongly advised that you have at least 33” AT tires, 2.5 inch lift, Sliders/rockers (body damage is possible), and a rear locker. (Note: There are bypasses on a lot of the trails, but not all obstacles will have a bypass). If you are new to wheeling and have very little experience, we recommend you participate in the Espinoza Loop run listed below. Staging Area: Please be at 4 corners staging area and ready to go (aired down and sways disconnected) by 9:00 AM. The Easy/Family trail will be the Espinoza Loop ending at the fire watch tower. Minimum Requirements: Although the trail is easy, it is recommended to have a tow point front and rear, and your own strap. Staging Area: Please meet in the parking area approximately ¼ mile after you turn off of Buckman Springs road, heading towards the 4 Corners Staging area. We will have someone there to flag you down and direct you. The group will stop at 4 Corners on the way out to pick up any stragglers. If you plan to air down or disconnect your sway bars, please allow time to have this done by 9:30. 1. We have organized these runs for you to be led by an assigned trail lead team. For the moderate to difficult trails, the Trail Leads will make the final call on if your Jeep is up to the task, or if it will slow down the group too much. Any decisions made by the trails leads does not mean anyone dislikes you, we just have to get ~80 Jeeps in 3 groups through these trails and back before the BBQ starts. 2. We will have waivers for all participants in these organized trail runs to complete at the staging areas. We ask that, while participating in these organized runs, you follow the direction of your trail leads whose main objective is to get you all back to the BBQ safely, with no damage, and in time. * Adventure Passes – we should be OK without these as long the vehicle is only staging for a short period of time and not going to be left sitting in the parking lot. If you plan on leaving a vehicle in the lot you may want to purchase a pass at any Big 5, Sport Mart or Sports Chalet). From 2:00-4:00 PM, following the trail runs, we will have a BBQ at the day use open pavilion at nearby Lake Morena (approximately a 7-minute drive from Corral Canyon and Buckman Springs road). **Every Jeep not camping will be required to purchase a $3 day pass at the Ranger Station. 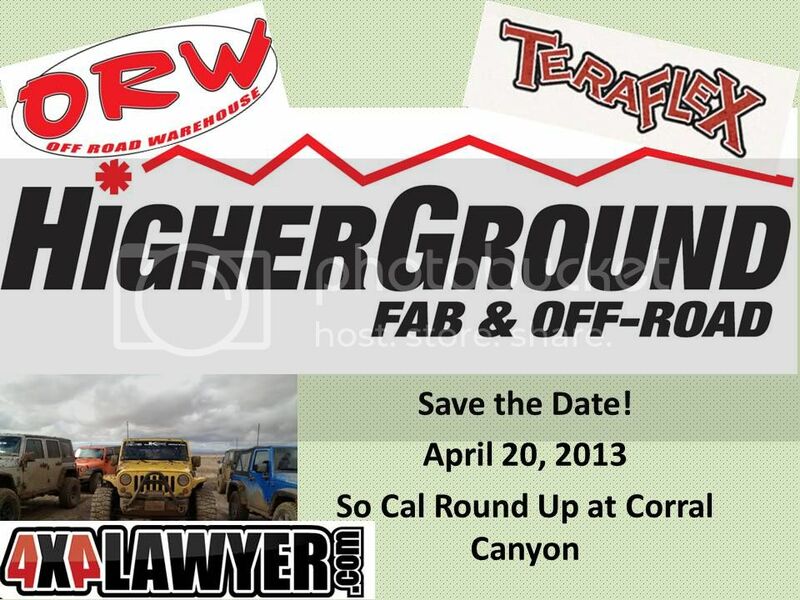 Higher Ground Fab & Off-Road, 4X4 Laywer, ORW and Teraflex have generously agreed to provide the main course and fixins, but we are asking that you bring our own beverages, and if you're feeling generous, a side dish to share for at least 8 people. * We will have some ice chests available in the BBQ area on Saturday morning for those of you who may need to drop your stuff off while you are on the trail runs. A drawing will be held following the BBQ at 4:00 PM. There will be one entry per Jeep, and everyone signed up by the deadline will automatically have your screen name submitted for the drawing. You MUST be present to win! Lake Morena Campground is full. Anyone who does not have a site yet, please post up on this thread...there may be someone with extra space. Otherwise there is camping in 2 campgrounds at Bronco Flats. Please alse be sure to adhere to the campground rules, be respectful and clean up after yourselves. We will have quite a few Jeeps here and we want to leave a good impression and be invited back---because Jeepers are awesome! ** For those of you who signed up on the "save the date" thread -- please let me know how many adults/children will be with you ASAP. Thanks! Last edited by Blonda; 04-18-2013 at 10:06 AM. The family and I are in for trails and camping. It will be me, my wife, and my daughter. Screen name is *Seth* and we will bring a side dish to the BBQ. Hey Dave is that one jeep four adults? We booked site #58! What site did everyone book and what dish...hoping B brings her bean dip good stuff! Why are there two threads??? I reserved #75 & #76 for Friday and Saturday nights. Last edited by OVRNUNDR; 03-21-2013 at 06:26 AM. Just getting the hang of planning bigger more formalized events like this. We'll be there. Just me and Wyatt this trip. Camping, site 70. Sharing with *Seth* and his family. Last edited by DesertJeep; 03-21-2013 at 06:55 AM. I'll be there plus one.